WASHINGTON — House Democrats are sweeping into power this week on a campaign promise of improving government for ordinary Americans. But first, they’ll have to get government reopened from the partial shutdown. It’s a cold opening for the new majority, setting up an early confrontation with the Republican-led Senate and the White House and testing the House Democrats’ ability to make good on their campaign pledge to focus on kitchen-table issues in the new era of divided government. So far, House Democrats appear largely unified in their plan to vote to reopen government without the money Trump is demanding to build the border wall. Jeffries said that while Trump wants to “waste millions in taxpayer dollars on a medieval border wall,” Democrats are drawing “a line in the stand” against the spending they say won’t make the border any safer. But with Trump dug in over the $5 billion he wants to build the wall, the shutdown could drag on. Senate Republicans are reluctant to consider the House bills unless they know the president is on board. The first signal Trump has given that he may be willing to talk about the wall impasse came Tuesday, when he tweeted, “Let’s make a deal?” He’s invited Democratic and Republican congressional leaders to a White House meeting Wednesday on border security. As the partial government shutdown continues, more federal workers — just 15 percent of whom work in Washington, D.C. — are notified of whether they will be furloughed or required to work without pay into the new year. 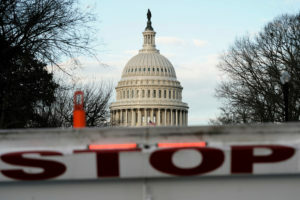 NPR congressional reporter Kelsey Snell joins Alison Stewart from the capital to discuss the financial impact of the shutdown and how nine major government agencies are affected. Democrats are eager to move forward in the House on multiple fronts. They’re set to approve a rules package on Thursday that sets a new tone for governing. For example, it requires that legislation first be considered in committees before bills are brought to the floor for votes. It bans lawmakers from serving on corporate boards. And it recognizes the diversity of the new freshmen class by easing a century-old rule against wearing hats on the chamber floor to allow Rep.-elect Ilhan Omar, a Muslim-American from Minnesota, to wear a head scarf. By early next week, House Democrats are expected to consider a resolution to defend the Affordable Care Act in legal proceedings after a Texas judge ruled it largely unconstitutional in a legal challenge brought by Republican attorneys general from several states. H.R. 1, the first bill of the new House majority, is a good-government package that tackles campaign finance reforms and other issues. It will begin making its way through the newly bolstered committee process. And they will continue their oversight of the Trump administration and Russian interference in the 2016 election. Incoming Rules Committee Chairman Rep. Jim McGovern, D-Mass., insists the new majority can “walk and chew gum” at the same time. Still, corralling a large House majority has never been easy, and Democrats are ushering in the largest class since the Watergate era. Republicans under retiring Speaker Paul Ryan all but gave up trying to the muscle the conservative House Freedom Caucus in line. It was the Freedom Caucus leaders who urged Trump to fight for the border wall money and reject legislation that would have prevented the shutdown days before Christmas. Pelosi is expected to regain the gavel Thursday, securing the votes to become speaker even after some new and returning lawmakers signaled they wanted new leadership. She would be the first woman to hold, then return, to the office. But divisions remain, rearing up even before the newly elected members are sworn into office, as many are eager for change and ready to confront Trump. Rep.-elect Alexandria Ocasio-Cortez of New York has been critical of the leader’s plans to create a Select Committee on the Climate Crisis. She prefers a panel that focuses on renewable energy investments and whose members refuse campaign donations from oil and other fossil fuel industries. Trump and Republicans have been eager to widen those divisions, especially as the shutdown stretches into its second week. Republican Rep. Kevin McCarthy of California, the incoming minority leader, panned the Democratic effort to reopen government without wall money. Democrats vow to stay united as they work to reopen government, and press on with the priorities.